Eastern European destinations dominate a new league table of cities offering the best value getaways for travellers. 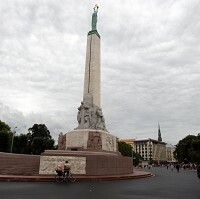 According to Post Office Travel Money, Latvian capital Riga is the most affordable of the 19 cities surveyed across Europe and the US. Rankings are based on typical holiday costs covering transport, one night's stay and other expenses. The average total cost for a trip to Riga was estimated to be around £114.92, with additional travel insurance cover unlikely to dent its stature as the best value city. Prague was placed second with £134.79, while Budapest, Estonian capital Tallinn and Warsaw completed the top five. Dublin (£160.78) came in seventh on the cost table - ahead of ninth-placed Edinburgh (£202.85) and London (£237.10) in 12th spot. The overall cost of travel to Dublin has dropped 12.3% from a year ago. Stockholm was the most expensive city, costing £313.64. While a return bus or train transfer from the airport to the city centre cost £1.39 in Riga, it would set visitors back £18.62 in Stockholm. Similarly, while one night for two adults in a three-star hotel in Riga cost £52, the equivalent in Stockholm cost £113, while in New York it was as much as £166. The two US cities included in the survey were New York and Boston.